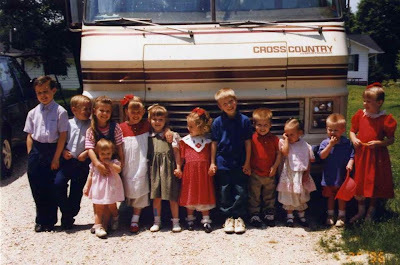 The Duggars have been friends with the Bates, a family from eastern Tennessee that also has 19 children, since their oldest kids were under four feet tall. Take a look at this throwback photo of the two families, circa 1995. Actually John David is already a police officer. He also is a pilot. The photo is very cute. When these two families first met each other it must have been like finding your soul mate friends or something. I say from left to right it's: Josh, John David, Michaela (holding Carlyn or Jinger? ), Jill, Erin, Jessa, Zach, Lawson, Alyssa?, Nathan, and Jana. That's probably all wrong! Ha! I think that's Jinger not Alyssa because of her outfit. Could you name them for me like a left to right or something? You can definitely tell who Josh and John david and Jessa are, Jessas the cute curly hair kid looking to the left. Does anyone knows why jessa asked for so many rifles as wedding gifts? That is so not Duggar like maybe is Bens idea why? THAT is No weddig gift. I know right? That is something that u pick out for yourself.Its a personal use.When you think of guns you think of violence no matter how u look at it. I think sometimes they put things on a registry just to make fun of their critics. I don't think the guns are an example of this, but I do think maybe the cereal on Derick and Jill's list was a poke at over critical people. It is Duggar-like. There are many photos of the family with guns and Ben and Jessa went on a date to an indoor shooting range that they stated the Duggars had used before. Don't blame it on Ben as clearly Jessa was familiar with guns. Actually, now that I look at your comment again, I'm not sure if you are bothered by the guns or by the gimme gimme attitude? Sorry if I misinterpreted and thought it was about the guns. If it's the sense of entitlement and lengthy, expensive, registry of luxury items, I don't think it's fair to blame it on Ben. You turn a young couple loose with the gift registry scanner and this is what you'll get. First off, they needed someone like Anna to help them with a practical list of what is actually needed to run a household. Neither has lived on their own so they just don't have the experience to know. Secondly, they are young. Ben is 18 I think? Third, Jessa has become used to the comps and freebies from being a public personality and she knows no better than to ask for crazy expensive things. Jessa and Ben have registered for over $30,000 in gifts on their wedding registries combined. How sweet! And yes! We'd love to know who is who!!! Could you tell us that, Lily & Ellie??? They need to take a picture, in the same sequence, with the all the kids at their current age. It would be fun to see then and now. It's a big trend right now to recreate childhood photos with the siblings as adults, right down to trying to wear the same sort of clothes. Since Jinger has the photo equipment, I think they could generate a lot of fan interest by taking your suggestion. It also gives Jinger more experience and exposure for her hobby. She could publish the photos side-by-side with the original ones on the Duggar website! Left to rt - Josh; John-David; Michael (a) hugging younger sis Alyssa; Jill; Erin; Jessa; Zach; Lawson; Jinger; Nathan; Jana. All the duggar girls have bloomers showing at the bottom of their dresses. Could you tell us who the kids are in the picture? Oh my goodness - crazy cute!! Love these 2 families! God bless them all! Heard it through the grapevine that Kelly Bates' # 20 will soon be announced! So excited for them!!! Natalia I am from the fifties babies and I can tell you there was plenty to worry about with our 'generation'. The book 'Growing up Duggar' would have been useful then too. I am just reading it and I am amazed at what was taught to the young Duggar women so comprehensively. I am benefiting because I wasn't pointedly taught any of these lessons by anyone. But still your point is well taken about today's youth. How do we start teaching kids who are willing to spend countless hours on video games the lessons the Duggars/Bates already know? I think the key to any generation or family is that the adults do give more guidance to their children. But how do we get them respecting us and listening to us now? @ Anonymous #19.....that is such a great idea. Hi Lily and Ellie I am Going to Jessa and Bens wedding too !! Can't wait to meet you!!! Hey Lily & Ellie!! This is SO cute!!! Could you please name them for us or get a picture of the same people now? It would be so cool!! By the way, I think they are Josh, John-David, Michael with Alyssa, Jill, Erin, Jessa, Zach, Lawson, Jinger, Nathan and Jana! I am certain with Josh and Jessa! They haven't changed that much!! :) May God bless these blessings!!! How do the Duggars keep out crazy people from their weddings? Do they make people show their invitation to get in? I just wondered since the weddings are so large, it seems like it would be easy to sneak in. I mean like reporters from the tabloids or the critics at the Free Jinger website. I know they don't like people to bring in smartphones to prevent early leaks of their pictures, but how do they do it? I would be SO worried about crazy people coming in and sabotaging the big day. It's too special to be ruined by crazies. Does anyone else wonder if there might someday be a Duggar-Bates wedding? @Jennifer I think Jana will marry a Bates man.